Kino Lorber are back with another classic horror film releasing on 14th March 2017 on DVD and Blu-ray in the U.S.A.
His Terrifying Secret… His Hideous Obsession… Made Him The Man Who Could Cheat Death! Dr. Georges Bonnet has figured out a way to live forever, all he needs are glands from some very unwilling donors! Anton Diffring (Where Eagles Dare, Circus of Horrors) stars as the mad doctor in this chilling Hammer Horror classic. As he struggles against the inevitable icy grip of death, the doctor begins a descent into madness that threatens to destroy the laws of nature and the lives of those he cares for the most; the only person who could stop his unholy quest is horror legend Christopher Lee (The Oblong Box). 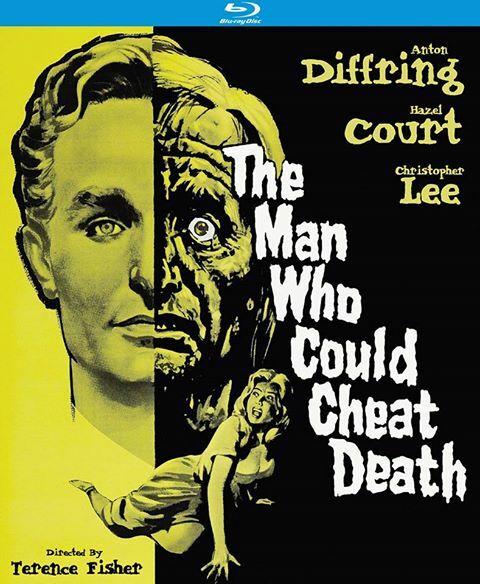 Great direction by Hammer legend Terence Fisher (Horror of Dracula) with a screenplay by Jimmy Sangster (Dracula: Prince of Darkness) based on a play by Barré Lyndon (The Lodger). Co-starring the beautiful Hazel Court (Premature Burial).